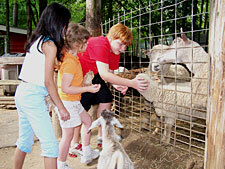 Fun stuff is happening year 'round at the Game Ranch! Wild and very happy turkeys celebrate the season! The Game Ranch accepts your leaves and acorns-- perfect winter treats for our animals. Visit the Game Ranch during November and you'll receive a coupon to return with a friend between 12/1 and 12/19-- your friend gets in free with your paid admission! Back by popular demand... our annual "Dollar Day" at the Game Ranch! Everyone admitted for only $1 on Tuesday, December 20 only. Call for Christmas trees... needed for the animals' winter shelter and nesting area for babies. General Beau Lee, Georgia's Official Weather Prognosticator, emerged from his Official Mansion to search for his shadow. Learn more about this glorious event! "Here a Chick, There a Bunny"
Special display of our animal babies! Baby chicks, ducklings, bunnies, piglets, lambs and kid goats to pet and feed and "ooh and aah" over. Scott Fuss, professional sheep shearer, provides annual trim for overcoated sheep, just in time for soaring summer temperatures. Karie Bell demonstrates dying and spinning of wool. Find out how you got your favorite pair of socks! Twenty to thirty fawns are born-- it is an unforgettable view of Nature. Orphan fawns are bottle-fed daily. 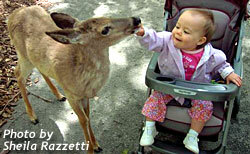 Watch Whitetail Deer munch at "The Salad Bar" in the Barnyard daily from 4:00 to 4:30 pm. Make plans to bring the whole family on Grandparents' Day. Majestic antlered bucks are on display. Enjoy this spectacle from "The Overlook."